Each year, residents are invited to participate in the Resident's Voice Challenge, as a part of Residents' Rights Month. Each year, the Consumer Voice develops a packet to help you plan your Residents’ Rights events. The packet is completely downloadable and features ready-to-use items, including promotional materials, activities to celebrate Residents' Rights Month, training tools and resources. Check back as more Residents' Rights Month packet materials become available. Residents' Rights Month Activity Calendar - A printable calendar with event and activity ideas for each day during October. Get your planning started now! For this year’s Resident’s Voice Challenge, long-term care consumers were encouraged to pick up their pens, dust off their type writers or use a computer to display their writing or artistic skills by submitting essays, poems, artwork, drawings, or videos related to the theme for Residents' Rights Month 2017 "It’s All About Me: My Life, My Care, My Choices". See this year's entries. 1. )What are the kinds of choices you should be able to make? 2. )What factors contribute to the quality of life in your facility or at home? 3. )What do you think it will take to bring about good quality care in nursing homes and other facilities? Find more information on submission criteria here. Spread the word about this year's Resident's Voice Challenge with this flyer. Any questions about the Resident’s Voice should be directed to info@theconsumervoice.org. This year, we have two great products for sale in celebration of Residents' Rights Month! Promote residents' rights year-round with the new Residents' Rights posters. This easy-to-read poster provides important information for all staff, volunteers, residents and advocates. Posters are printed on sturdy, glossy paper. Choose the horizontal or vertical layout and 11"x17" or 18"x24" sizes depending on your needs. Display these posters in facilities, resident rooms, or offices of advocates as a reminder of the important rights to which all residents are entitled. 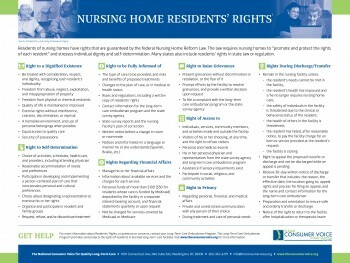 Residents' Rights Posters are currently available for pre-sale and will be shipped beginning August 1st. Purchase a 11"x17" or 18"x24" poster today! Remember: Consumer Voice members receive 10% off all items in the online store. Join or renew your membership here. Email info@theconsumervoice.org for the discount code. Connecticut’s Annual Voices Forum, October 5, 2017, is titled “It’s All About Me” and Consumer Voice's Robyn Grant is the keynote speaker. Her presentation is about Person-Centered Care. She will discuss how person-centered care can be promoted by the individual resident in his/her care plan and also how residents can collectively promoter person-centered care through their Resident Council. Each resident will receive a ball cap with “My Care Matters” to take home with them. The Executive Board of Presidents of Resident Councils created a short video “It’s All About Me” and this was submitted to Consumer Voice and will also be shown at Voices. The Ombudsman asked area homes to create “It’s All About Me” placards for residents to display throughout the Voices Forum. An article was published in the Morning Times in Sayre, Pennsylvania about honoring long-term care residents during Residents' Rights Month. VOYCE, a nonprofit organization that advocates for individuals receiving long-term care in St. Louis, Missouri, issued a press release about Residents’ Rights Month 2017. Pennsylvania’s Long-Term Care Ombudsman Volunteers are hosting Facebook lives events every Wednesday in October to celebrate Residents' Rights Month 2017. VOICE (Voice of Inspired Change for Elders, formerly known as Pennsylvania Culture Change Coalition) and the Pennsylvania's Long-Term Care Ombudsman Office are partnering to offer a free webinar on Thursday, Oct. 26, 2017. The webinar focuses on person-centered care planning and space is limited. The Michigan Long Term Care Ombudsman Program recently published new Residents’ Rights bookmarks for Residents’ Rights Month 2017. A Letter to the Editor was published in the South Missourian about Residents’ Rights Month and recognizes the local, long-term care Ombudsmen staff and volunteers of Missouri. The Long-Term Care Ombudsman for Pagosa Springs, Colorado wrote a letter in the Pagosa Springs Sun discussing Residents' Rights Month. An article was published in the Muskogee Phoenix, a newspaper in northeast Oklahoma, talking about the history and background of Residents’ Rights Month. A guest column was published in the Peninsula Daily News, in Port Angeles, Washington, about Residents’ Rights Month and respecting residents. The Upside to Aging blog published a post on Residents’ Rights Month. An article published in The Harvard Press, from Harvard, Connecticut, talks about Residents’ Rights Month and its effect on changing the culture of nursing homes. A letter to the editor from the Regional Long-Term Care Ombudsman Program Director of Wheelersburg, Ohio talks about Residents' Rights Month. The Office of the State Long-Term Care Ombudsman in Georgia celebrated Residents' Rights Month on October 24, 2017. The Vindicator, an online newspaper in Youngstown, Ohio, published a Letter to the Editor about Residents' Rights Month. An Inaugural Resident’s Rights Gala was held in Midland, Texas on October 17th at La Hacienda Event Center. An article published for Hood River News, in Oregon, talks about Residents' Rights Month and new Oregonian legislature in 2017. Have something planned for Residents' Rights Month? Let us know! Email details for your events and activities to info@theconsumervoice.org.